Historically, the western bean cutworm was only a pest in the western Corn Belt. Over the past several years, it has become established in Iowa and has moved steadily from west to east, having been discovered in southeastern Iowa in 2004. Growers in Illinois counties along the eastern border of Iowa should be aware of the potential for thiscorn insect pest to make its way into Illinois. The western bean cutworm is a severe pest of corn and dry beans, affecting both crop yield and quality. Unlike other cutworms, the western bean cutworm is a late-season pest of corn. 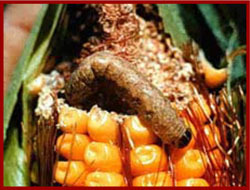 It feeds primarily on corn ears, chewing and scarring kernels, predisposing the ear to fungal and mold infections. First-instar western bean cutworm are dark brown, with diamond-shaped markings on their back. As the larvae mature, they become light tan to pink in color and the markings on their back become more distinct. Western bean cutworm larvae that are third-instar and older may be distinguished from other cutworms and caterpillars by three distinct stripes right behind the head. Brown colored, moths are approximately ¾" long with a 1½" wingspan. Forewings of the moth are brown with a white/creme-colored stripe that runs across the leading edge of each wing. Just below this stripe, and about halfway across each wingis a white spot. Further away from the body, in line with the spot, is a white, crescent shaped spot. The hindwings of the adults are unmarked and light colored. Eggs of the western bean cutworm are white, with a thin, red ring on top when first laid. Within 2 days, they turn tan and by the fifth day, turn dark purple. 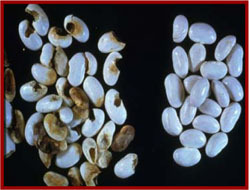 Western Bean Cutworm Larvae (left photo courtesy of Montana State University, right photo courtesy of Marlin Rice, Iowa State University). Western Bean Cutworm Adult. The red arrow points to a white spot with crescent-shaped marking. (left photo courtesy of University of Nebraska-Lincoln; right photo courtesy of Marlin Rice, Iowa State University). Western Bean Cutworm Eggs. (left photo courtesy Montana State University; right photo courtesy of University of Idaho). One generation of western bean cutworm occurs each year. Moth emergence usually begins in early July. After mating, females lay eggs on available host plants such as field corn, sweet corn, popcorn, or dry beans. Females also may lay eggs on tomatoes, nightshade, and ground cherry, although these are not preferred oviposition hosts. In corn, female western bean cutworms lay eggs primarily on the upper surfaces of the leaves. Fields attractive to western bean cutworms for oviposition are fields in which corn is tasseling or near tasseling and fields that have hybrids with upright leaf characteristics. Egg masses contain an average of 50 eggs, but numbers of eggs in a mass range from 5 to 200. Eggs turn from white to tan to dark purple as they age, andlarvae hatch within 5 to 7 days after the eggs are laid. After hatching, larvae feed on the shells of the eggs for about 10 hours before moving to other protected feeding sites. Larvae pass through five instars and feed on host plants for about 31 days. After a larva finishes feeding and completes development, it drops to the ground and burrows beneath the soil, where it constructs an overwintering cell. Western bean cutworms spend the winter in the prepupal stage. In May, western bean cutworms pupate, and they emerge as adults during the summer. In Corn: First instars are very mobile and may infest several host plants. Newly hatched larvae move to the corn whorls where they feed on the flag leaf, tassel, and other yellow tissue. As corn tassels and silks, larvae move to and begin feeding on developing silks. Larvae feed directly on silks in post-tassel corn. Because of their dispersal behavior, larvae from one egg mass may infest other corn plants in the same and adjacent rows in an area 6 to 10 feet in diameter. As both larvae and corn develop, the larvae begin feeding on ear tips. 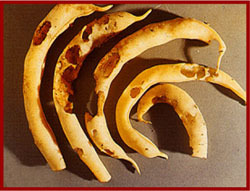 The larvae also may chew through ear husks and damage developing kernels. 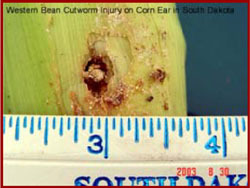 An infestation of more than one larvaper ear may occur because western bean cutworm larvae are not cannibalistic, unlike corn earworm larvae. One larvae per ear rarely causes economic injury, but studies show on a field-wide basis, that one larva per plant can reduce yield by 3.7 bu/acre. During years with severe infestations, multiple larvae per ear may be common. 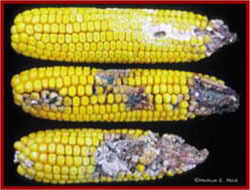 Under severe feeding pressure, 50 to 60% of an ear's kernels may be damaged. Western bean cutworm larva feeding on corn ear. (Photo courtesy of University of Nebraska-Lincoln). Corn damaged by western bean cutworm larvae. (Photo courtesy of Marlin Rice, Iowa State University). Injury on dry beans caused by western bean cutworm larvae. (Photo courtesy of University of Idaho). Damaged and undamaged bean seed. (Photo courtesy of Montana State University). In Dry Beans: Eggs are laid in areas of dense bean foliage on the lower surface of leaves. As in corn, western bean cutworm larvae have great ability to disperse. Larvae may disperse up to 12 feet within a row and 10 feet across rows. When larvae approach ½" in length, they begin feeding at night on young leaf material and blossoms. Larvae chew holes into pod walls and developing seeds. Most feeding occurs on cloudy days or at night. During the day, older larvae may be found in the soil seeking refuge. As beans are cut, and if western bean cutworm development is not complete, larvae may congregate under the windrow, feeding on pods and seeds until harvest. Little is know about economic injury levels and yield loss, as well as dockage. Scouting for western bean cutworm should begin when the first moths are noticed. Western bean cutworm moth flights usually begin in early July. The emergence date of moths can be predicted by calculating growing degree days, beginning May 1, using a base temperature of 50°F. Pheromone or black light traps can be used for detection of the moths. Monitoring should continue until after the moth population peaks. Degree-day accumulations in relation to percent moth emergence (begin May 1, base 50°F). Western bean cutworm and injury in corn. (Photo courtesy of M. Catangui, South Dakota State University). In Corn: Examine the upper surfaces of plant leaves for egg masses and/or small larvae. Also, examine tassels for larvae before pollen shed. Check 10 consecutive plants in at least 5 random locations in the field. Since egg laying varies with plant growth stages, sample hybrids with different maturities within a field separately. 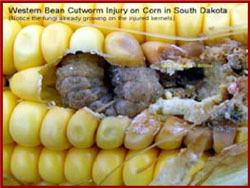 Don't confuse corn earworm infestations with western bean cutworm infestations! While both will feed on ear tips and kernels, they do have distinct differences. 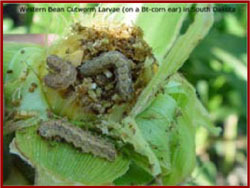 For example, corn earworm are cannibalistic, so usually only one is found per ear. Visual differences also exist between the larvae. 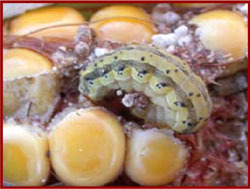 The corn earworm, comes in a variety of colors, ranging from brown to pink to green, it has lateral stripes along its body, and is covered by small dark spines. It also lacks the three stripes behind its head that the western bean cutworm possesses. In Dry Beans: Scouting dry beans for egg masses and larvae is very difficult. However, using pheromone traps, estimates of possible infestations, timing of field scouting, and optimal timing of control methods can be provided. Moths tend to lay more eggs in bean fields after corn has tasseled, usually corresponding to when pheromone trap captures begin to increase. Place two pheromone traps per bean field near field edges in early July. Traps should be monitored until peak moth flight. Larvae will begin to damage pods approximately 3 weeks after peak moth flights have been reached. Moths should be counted and the total accumulated between the initiation of the flight until the peak of the flight. The risk of significant damage is considered low when the cumulative catch is less than 700 per trap. When numbers are between 700 and 1,000, the risk is moderate. Examine bean pods for larval infestation and feeding 2 to 3 weeks after the peak moth flight.If moth count totals are greater than 1,000, the risk for damage is high, although not all high risk fields develop economically damaging infestations. Examine pods to determine extent of damage. Corn earworm and injury in corn. (Photo courtesy of Kelly Cook, University of Illinois). Monitoring and detection of the western bean cutworm is essential in the management of this insect pest. Insecticide applications are futile after larvae have moved under the husks. (Photo courtesy of South Dakota State University). In Corn: Entomologists at the University of Nebraska recommend that an insecticide treatment should be considered when 8% of the plants have egg masses and/or small larvae. Timing of an insecticide application is critical. If larvae have hatched, apply an insecticide after 95% of the tassels have emerged, but before larvae enter the silks. Control is more difficult after larvae have moved to the silks. Once larvae have moved inside the husk, insecticides are ineffective and larvae will feed until mature. If larvae have not hatched and the cornplants have tasseled, time the insecticide application to coincide with the hatch of larvae. If the eggs are purple, hatch usually occurs in about 24 hours. Currently, of the available transgenic corn hybrids, only those that contain the Cry 1F toxin (Herculex I Insect Protection) are labeled for control of the western bean cutworm. In Dry Beans: An insecticide treatment many be warranted (University of Nebraska) when pod feeding is significant. If an insecticide treatment is needed, application should be made 10-20 days after peak moth flight. Western bean cutworm injury on Bt corn ear. (Photo courtesy of M. Catangui, South Dakota State University). Few cultural controls are effective against this insect pest. Plowing or disking soil is thought to reduce overwintering larval survival, but the effectiveness of this practice on a broad scale is unknown. There are several natural enemies and predators of the western bean cutworm, Spiders also may reduce western bean cutworm densities. Larvae also are susceptible to the disease pathogen Nosemasp., but the impact of this pathogen is unknown. Predation by birds such as crows and blackbirds, especially to larger larvae, has been observed. *Many of the pictures used on this factsheet are taken by professionals from other universities, please visit their respective websites for additional information and photos on the western bean cutworm.